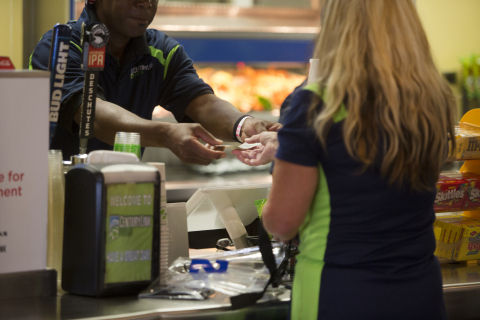 SEATTLE & NEW YORK & AUSTIN, Texas--(BUSINESS WIRE)--First Data (NYSE: FDC), a global leader in commerce enabling technology and Bypass, an innovator in enterprise point-of-sale solutions, today announced that they have teamed up to provide the Seattle Seahawks with cutting edge commerce technology at the Seahawks’ home, CenturyLink Field. With First Data’s integrated solution for Bypass, the two companies are working to revolutionize the fan experience at the stadium, starting with a full-venue deployment of hundreds of Clover point-of-sale devices. CenturyLink Field and CenturyLink Field Event Center host more than two million people per year, all of whom want to be able to quickly purchase food and beverages so they can make it back to their seats in time for the next play or set. With Clover and Bypass, the concession buying experience becomes quick and convenient for all attendees. Shorter lines: concessionaires can use First Data’s Clover Mobile to “line bust” or take payments directly in the stands. Additionally, the point-of-sale systems are easy for concessionaires to use, ultimately cutting down on check out time. Flexible and secure payment options: fans can use a variety of payment options, including NFC payments and EMV chip cards, while having the peace of mind that their transactions are protected with the highest level of payments security. “This is a major milestone for us, and a testament to the value we and Clover bring to fans and teams,” said Brandon Lloyd, Bypass CEO. In addition to the point-of-sale systems located throughout the venue’s concessions stands, restaurants, bars, and suites, the deployment also includes Bypass’s comprehensive back office management tools and a robust insights engine for food and beverage operations. This suite of tools helps the Seahawks boost payment data security and garner key insights from their food and beverage business that can assist to enhance the fan experience. Because these tools are based in the cloud, they provide secure access to real-time reports and alerts, giving the Seahawks a deeper understanding of how each game is progressing and helping them align on opportunities to make future games even better. First Data can also provide sports teams with game-changing analytics to help improve sales, marketing, and business development initiatives. With the robust data sets provided by First Data, teams can better understand where their fans are coming from, specific timing of spending, and how attendees are spending their money in the area outside of the stadium. The CenturyLink Field deployment is the fourth major roll out of Bypass and Clover solution following the July partnership announcement First Data and Bypass. The two companies are incredibly proud to be chosen by the Seahawks for their first NFL full-venue installation. Since its founding in 2010, Austin-based Bypass has become the leading innovator in enterprise point of sale systems, robust back office management tools, and rich insights engines for the multi-site food & beverage industry. It helps more than 160 professional & collegiate sports venues and national restaurant chains accelerate profit, efficiency, and guest experience well beyond levels achieved with legacy solutions. Bypass makes this happen with tablet POS terminals and a cloud-enabled open API platform broad enough to serve the full spectrum today’s needs and agile enough to support future requirements. More information is available at www.bypassmobile.com.